Psst. Hey, Buddy — Wanna Buy a Rembrandt? Scaffolding had been erected on the exterior of the Kunsthistorisches, Vienna’s famed art museum, to facilitate sandblasting of the facade. The scaffolding also provided a convenient way for an art thief to enter a second-story window at 4 a.m. on May 11, 2003. His break-in triggered a motion-sensing device, alerting a museum guard to get out of his chair and shut off the alarm without investigating further. The thief, who perhaps coincidentally was a security-alarm salesman, smashed a glass case and removed its contents: a gold and ebony sculpture valued at approximately $50 million. Crafted in the 1540s by Benvenuto Cellini and known as the Saliera (salt cellar), it’s the last surviving work in gold by that artist — over the centuries, the others had been melted down. It was feared that might be the fate of this sculpture as well, but Robert Mang seemed to know that the object was worth far more than its salvage value. He kept it for a couple of years under his bed; eventually he buried it in a lead box in a forest outside Vienna. Mang then sent a ransom note to the museum’s insurance company, demanding 10 million euros. A cat-and-mouse game ensued; Herr Mang used cell phones to send text messages to set up a clandestine meeting. He was eventually caught because an electronics store security camera recorded him buying a cell phone that was used by the thief to send text messages. 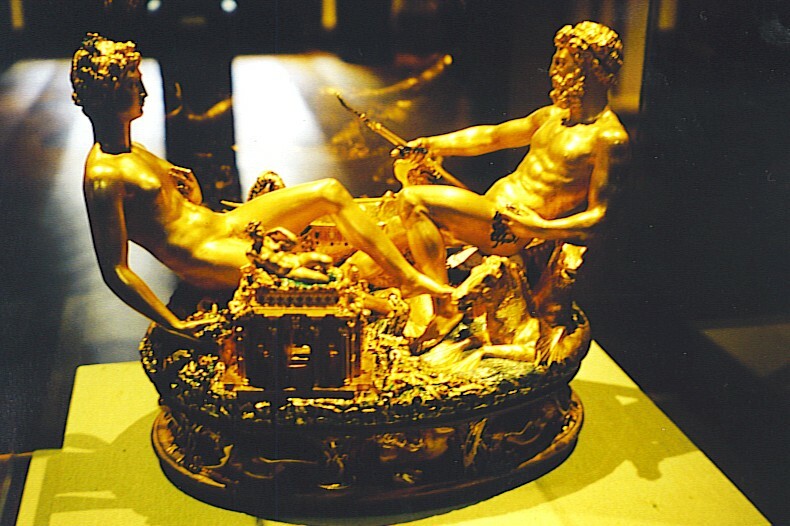 The Cellini salt cellar was recovered, relatively unharmed, on January 21, 2006. In this instance the motive for the theft was financial gain, but that hasn’t always been the case with stolen art. In August, 1911, the Mona Lisa — yeah, the world’s most famous painting — was taken off a wall in the Louvre. The thief had gotten in on a Monday, when the museum was closed to the public. He seems to have blended in with cleaning crews and other staff, then snatched the painting, leaving its frame in a staircase. As you might imagine, a frenzy of police investigation ensued, and among those questioned about Mona’s disappearance was a young Spanish painter named Pablo Picasso. He had nothing to do with it; the thief turned out to be a former Louvre employee of Italian descent. In 1913, Vicenzo Peruggia made contact with an art dealer in Florence, admitting that he had stolen La Gioconda (as Mona is sometimes known) in order to restore to Italy what had been stolen from it by Napoleon. The art dealer met with the thief, who produced the painting from a trunk in his hotel room. The art dealer was a bit of a con man himself, apparently. He (and the director of the Uffizi Gallery, who was with him) convinced the thief that they would need to compare the painting to other known works by Leonardo to verify its authenticity. Peruggia let them walk out the door with the Mona Lisa, and he was apprehended by police soon thereafter. The Louvre got its star attraction back on December 30, 1913. The motive behind the biggest art theft in history remains unclear because the case remains unsolved. In the early hours after St. Patrick’s Day, 1990, two guys in police uniforms pounded on the door of the Isabella Stewart Gardner Museum in Boston. They told the museum guard that there had been reports of a disturbance on the grounds and that they needed to investigate. Within minutes that hapless guard and his colleague were both in handcuffs and gagged. The thieves spent over an hour gathering loot, which included a masterpiece by Vermeer and three works by Rembrandt. One of the latter, “Storm On The Sea of Galilee”, is his only known seascape. Other art works were taken as well; the value of the total haul is at least $300 million. There have been occasional leads in the case, but as of this date they have all proven to be dead ends. So if you happen to be invited to the mansion of an underworld titan and notice an original Rembrandt seascape over the mantel, you might want to slip out and call the FBI. The Isabella Stewart Gardner Museum is offering a $5 million reward to get its artwork back. Just think — for that kind of money, you could make a down payment on your own Rembrandt! This entry was posted in Art and tagged art theft, Rembrandt, Vienna. Bookmark the permalink. Since you put quotes around Rembrandt, I’m guessing the attribution is in question. Even so, if the drawing dates to that period, it still has value. I look forward to hearing about the case! Thanks, Bill.